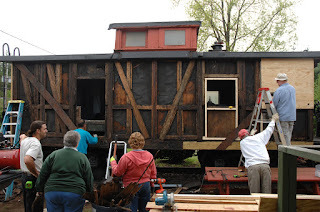 From Bob Platel, "Here is some new pictures of my layout." RS-3 4107 preparing to switch Cohoes Wertime trestle while U23B 2316 passing thru with 2 flat & a tank car of lube oil for GE. Leased B & M RDC stopping at Cohoes passenger station. Cohoes switcher pushing 3 boxcars of pulp to Mohawk papermill. 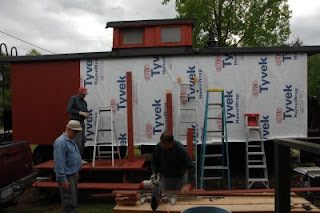 Here's some shots of on-going progress on the caboose- the C.R.O.C.K.S. 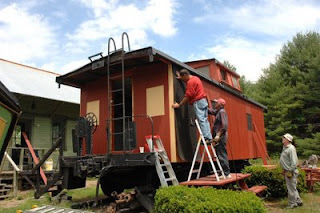 (Citizens Restoring Our Caboose at King's Station) have been putting in a lot of hours. 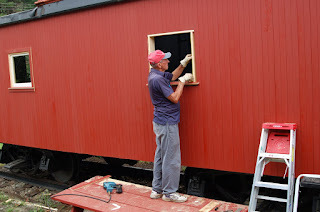 The siding is all up,and 4 windows have been built in place on the long sides. I've been grinding scale rust away from the metal parts, and hope to get the cupola windows operational this month. The red is just a primer. 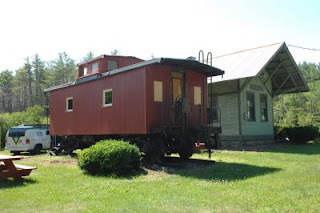 I'll be going to the Cooperstown and Charlotteville to get stencils saved from the Oneonta roundhouse for the logos. Please enjoy the attached photo! 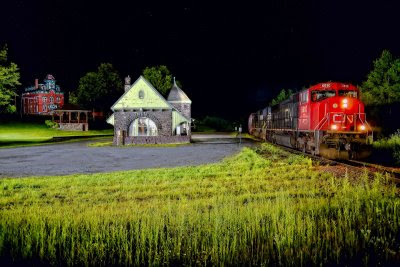 Returning to the compound in Hinesburg after a few nights "ovah" visiting the Saint Lawrence & Atlantic, my timing was good, as I heard D&H North End Dispatcher Gordy Smith announce the new lead unit on CP 930 to be the CN 5610! YES! I get another chance at this shot! The night before I left for the SLR the 5610 ran on 930 but a car was parked here in front of the station, acceptable for sure, I shot it but.......I'd rather not see the auto! LOL! I actually pulled off sleeping well in daylight at an abandoned fly fishermans camp, now a State Park, near the SLR on the Upper Connecticut. Tent camping, on the ground, no electricity, a great swimming hole! After putting up the tent, I unrolled the new "sleeping pad" then noticed the tag....."30 min. to inflate, inflate and deflate several times before actual use". OH. Ha,ha,ha! It's safe to say I have a new appreciation for the waterbed here at the compound! BUT I now have a place from which to roam on the SLR half the distance from Hinesburg. Much more enjoyable! A word of caution for anyone who feels they must drive in Northern New Hampshire after dark......drive slow enough so you can stop well within the distance you can see. I looked up at two moose on the road ahead of me during the same night recently. The males can weigh in at a ton! They are no problem as long as you drive slow. It's one thing when you come upon moose ahead of you in the road, and it's quite another thing when moose come upon you in the road! They appear at the last second out of your side vision up close, towering! So we enjoy a rare moment back here at Port Henry, as CN 5610 makes an encore appearance. Grass mowed to enhance this view from the stepladder, thanks guys! A timeless scene with the ex-LC&M G.O.B. illuminated up on the hill, the adrenaline rush arrives as the head end slowly passes the station moving into position for the photo. Shot on July 6, 2008 at 01:41, with the 5D and Zeiss ZF 28/2 set at f2. Please enjoy! Comments are welcomed!